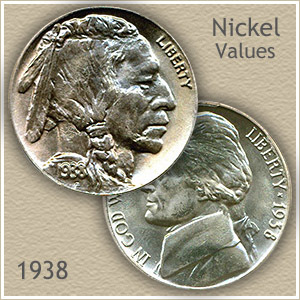 1938 nickel value is in a transition year with both Buffalo and Jefferson nickels minted. 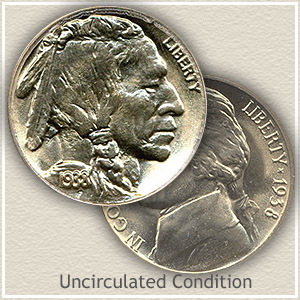 The Buffalo nickel, minted only at the Denver mint, however leads in value. Jefferson nickels minted in San Francisco follow closely worth 98 cents in "Good" condition. An exciting year, 1938 provides collectors with many choices and a wide range in values. An ending to the Buffalo series and a start to the modern Jefferson series, many variables come into play with 1938 nickel values. All nickels of this date are worth inspecting closely. Not only do mintmarks, indicating where minted, on Jefferson's have an effect on value, but the condition of your coins is critical to discovering higher value. Finding mintmarks on your nickels is discussed next, but first have a look at the "uncirculated" Buffalo and Jefferson nickels pictured. Coins in this finely preserved state are at the top of dealer and collector want lists and treasured. The valuable 1938-D Buffalo nickel minted in Denver marked the end to the series. The "D" is located on the reverse under the buffalo. The value guide also separates values according Condition along with the Mints that produced the coin. 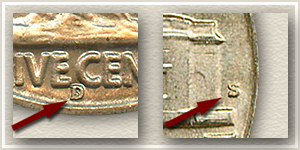 Under the Jefferson series a listing of "1938-S" is a coin minted in San Francisco, they used an "S" as a mark. A "D" is the mintmark used by the Denver mint. These two mints placed their mintmark on the reverse to the right of Monticello. The third mint to strike Jefferson nickels, Philadelphia, did not use a mintmark in 1938. A brilliant orange red toned 1938-D Buffalo with hardly a contact mark on both the obverse and reverse surfaces offered at auction by David Lawrence Auctions quickly paced to $240. Multiple bidders actively perused this coin because of its rare condition qualities. A uncirculated 1938 Jefferson nickel, boldly struck, itself uncommon for this year, can reach a value in the range of $200 to $300. However it takes an intensely bright lustrous and virtual mark free coin to reach such a lofty price. Of the millions minted such coins are the elite condition rarities. Uncirculated: The ultimate grade to a collector. A nickel in this condition shows absolutely no evidence of wear, it appears brand new. Mint luster covers the entire surface of the coin. Examine the high points for a dulling of luster, indicating wear. Extremely Fine: As a coin circulates friction begins to show as a slight loss of detail. 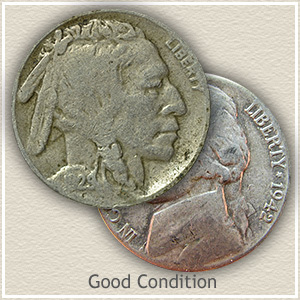 Although wear is noticeable your nickel still appears sharp and crisp, a Buffalo nickel in this condition is still a desirable coin. Fine: Additional wear has reduced the major details and eliminated the finer points of design. Obvious loss of sharpness and an overall smoothness is evident on the entire surface of the coins. Good: Buffalo nickels in this condition have a readable date, however parts of the numbers are often merged. Also the rim is no longer separated from the tops of the letters. 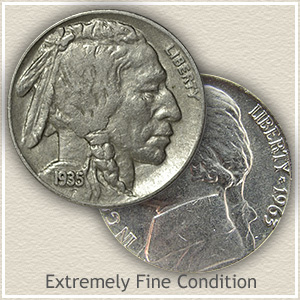 Jefferson nickels in "Good" condition have a tired and worn appearance and are worth minimum 1938 nickel value. 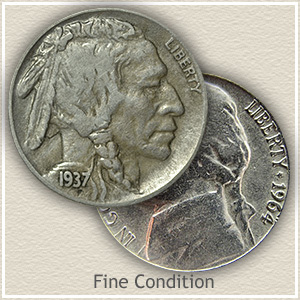 Including more grading details to your 1938 nickel value. Easily find how much your old coins are worth. Find values of all Nickel series from Shield nickels, Liberty, Buffalo and Jefferson nickels. All include value charts, along side grading images to find the accurate value of your old nickels. Coin Values Discovery... finds the 1938 nickel value and... all old US coin values. Value charts in combination with grading images to judge condition discovers how much your old coin are worth. Get the best price if selling by knowing the accurate value of your coins.